Your calves need a little of everything to grow: Heavy weight, high reps, short rest, and most importantly, solid programming to tie it all together. This is going to hurt, but don't worry—it'll be over soon! Let's face it: Despite our best efforts, some body parts simply grow at slower rates than others. It can feel like this is just because they're stubborn or you're cursed, but the answer when it comes to the calves is far simpler. Since the calves hold your weight all day and get activated with every step you take, it takes significantly more stimulation to force them to grow. I created this high-rep, quick-paced, three-exercise calf workout to shake my lower legs out of their complacency. It's a grinder of the first order, but my calves have grown tremendously. I brought them up from a weak point to a strong point with this workout alone. 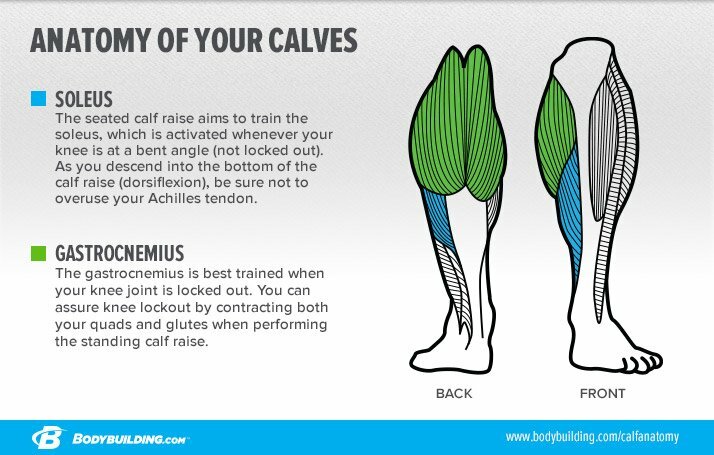 There are two muscles in the calf: the gastrocnemius and the soleus, each of which is best trained form a specific position. As I explained in "Six Major Mistakes Limiting Your Calf Growth," both muscles need equal attention to produce noticeable growth. This training protocol includes a specific lift for each muscle, then a third exercise to finish them both off at the same time. The gastrocnemius is best trained when your knee joint is locked out. You can assure knee lockout by contracting both your quads and glutes when performing the standing calf raise. I use a belt for the standing calf raise to help support my lower back and keep my torso rigid. Above all, focus on only using your calves to push the weight up in the Smith machine or calf-press machine. The seated calf raise aims to train the soleus, which is activated whenever your knee is at a bent angle. As you descend into the bottom of the calf raise (dorsiflexion), go low enough to feel a good stretch, but not so far that your Achilles tendon begins to bear most of the load. This is a common mistake that can lead to injury, so it's worth repeating: Once you get past a certain point, usually about when your feet start to roll inward, the tension comes off the soleus and gets placed on the Achilles. I also perform a slight double-clutching rep at the top of the movement. I press as high as I can normally, then let the weight sit there for a second, and try to press high to really force it to contract. I may only get it an inch higher, but it forces a fuller contraction of the muscle. The final exercise ensures that you thump both legs equally at the end of the workout. With this press, your knee is neither locked out nor completely bent. Thus, it engages both muscles in the calves when they're already worn down. It's a brutal but effective finisher! 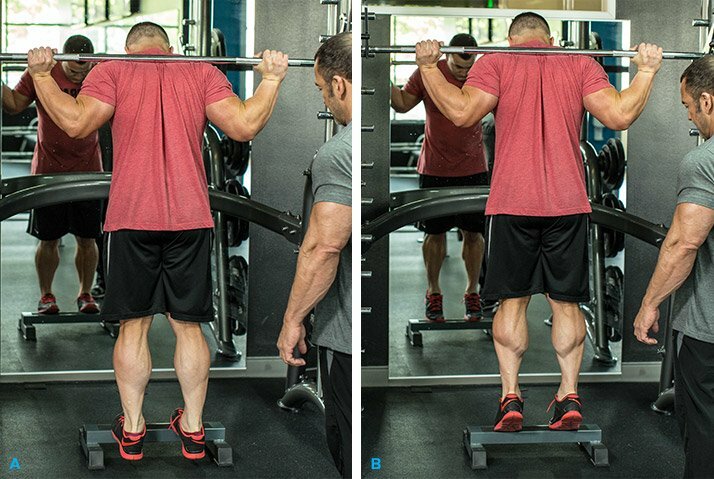 If growing your calves is a priority, perform this routine twice a week. Your muscles can take it if you can! You can expect to be sore for 2-3 days afterward, so programming it properly is crucial. One option is to start your leg workout with this routine. Sure, you won't be able to move as much weight in your squats and leg presses afterward, but this type of "priority training" is a great way to spur growth where you need it most. If your leg day is too important to tamper with, try pairing this routine with a noncompeting muscle group workout, like those I detailed in the videos "5 Moves to Massive Pecs," "5 Moves to Mile-Wide Lats," or "5 Moves to Massive Shoulders." But make no mistake: Wherever you put it, this routine won't be easy. It will hurt, but it will give you results!